Murray Polner is HNN’s senior book review editor. Those of us still around remember FDR’s presidency, his buoyant and often reassuring Fireside Chats, that cigarette holder held tight and jauntily in his teeth, Fala, his ever-present Scottish terrier and the physical and mental ordeal he underwent while wearing steel leg braces. His vision and deeds captured Americans like me (too young to vote) and those who voted for him four times, like Ronald Reagan. I once witnessed FDR’s campaign stop on a rainy Saturday morning in October 1944 in my Brooklyn neighborhood while he was on the way to a rally at Ebbets Field, where a friend told me he heard him say something like, “Next time I’m here I will come see the Brooklyn Dodgers,” our beloved team. He was magnetic and like his distant cousin Teddy, whom he greatly admired, he had political DNA in his blood, a quality that helped him rise from Hyde Park to Albany and Washington. 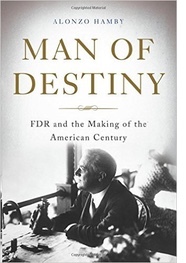 Hamby’s impressive one-volume Man of Destiny: FDR and the Making of the American Century, written with verve and clarity, is a largely a familiar tale told in much greater detail in, say, Jean Edward Smith’s massive FDR, but unquestionably still worth reading. FDR’s detractors, and there were many, called him “a traitor to his class,” an appeaser of Communists, a dictator and, unkindly to say the least, a Jew. Traditionalists, wedded to an unfettered market, denounced his use of the federal government’s intervention in the economy even to relieve the agonies of the Depression. He was often accused of toying with the truth as when he promised American parents before the 1940 election, “I have said it before, but I shall say it again and again and again: Your boys are not going to be sent into any foreign wars.” FDR knew it wasn’t so, but he was a politician and beating his opponent Wendell Willkie was all that mattered. From 1933-45, as Margaret Macmillan, the great Canadian historian reminds us in her recent CBC Massey Lecture (forthcoming as a book, History’s People) “FDR came to office at a dark time for the United States—how dark, we now sometimes forget. Even sober commentators talked of the possibility of widespread and violent civil unrest, even civil war.” He confronted mass, unprecedented joblessness, fanaticism at home and especially abroad, and then, a calamitous world war and its bewildering and unforeseen consequences. We remember his leadership against Nazi Germany and Japan but also that he also led Americans to expect Washington to help in times of great distress, as Hamby explains. He signed Glass Steagall to allow federal examination of banks – later repealed by Bill Clinton. He added all those alphabet agencies and programs: CCC, FDIC, TVA Social Security (its monthly payments were criticized by Dr. Francis Townsend as too low to alleviate poverty among the aged), the Wagner-Connery act guaranteeing the right of labor unions to organize and bargain collectively (now under challenge in some red states) and the WPA and PWA which created jobs and whose workingmen and women built LaGuardia Airport, Brooklyn College, the Oregon Coastal Highway, Miami’s 0range Bowl and the Triboro (now RFK) Bridge, and others. True enough, but FDR and his “kitchen cabinet” advisors were all about experimentation and innovation. The New Deal never really brought the Depression to an end until the war approached, serious rearmament began and workers were hired, a reminder that Randolph Bourne’s two decades-old aphorism that “War is the Health of the State” still made sense. Even so, it helped millions survive a very bad time. As the war drew to an end, a burning question was how to deal with postwar Russian control of Eastern Europe. Were there any realistic alternatives available to FDR, Churchill and Stalin? Postwar Russia was left with some 25 million military and civilian deaths, and its western regions and industries decimated in a war the Allies could not have won without them. The U.S. also needed them for the final push against Japan. Stalin was a sociopathic mass murderer but with very practical postwar goals: to surround his country with satellite and friendly states to prevent future invasions. Churchill and Anthony Eden, his Foreign Secretary, promoted their own spheres of influence idea dividing eastern and southern Europe between London and Moscow, a notion FDR could not abide given his loathing for imperialism. After the 1943 Teheran conference, and relying on his charisma, FDR met privately with Stalin, who may or may not have been ready to strike some kind of deal about FDR’s concept of world peace maintained by a global organization policed by Britain, Russia, France and the US. We’ll never know. Churchill also misread Stalin (and vice versa), thinking he too could deal with Uncle Joe, telling Field Marshal Montgomery, “if only I could dine with Stalin once a week, there would be no trouble at all.” Maybe not, but there’d also be a lot of empty scotch and vodka bottles lying around. Hamby goes further in wondering how FDR “might have reacted to Soviet ambitions for control of the rest of the continent, but he would not likely have responded as quickly and decisively as his successor, Harry Truman,” the ill-informed new President whose foreign policies set the U.S. on the road to endless cold and hot wars and a permanent, militarized, national security-obsessed Pax Americana, which a more cautious Dwight Eisenhower would warn against in his final address to the nation. Still, at a distance of seventy years, FDR, a flawed and complex giant and still somewhat inscrutable to those who write about him, remains a striking and extraordinary giant among all our presidents, as Man of Destiny makes clear.